Foirt Loramie’s Carter Mescher shoots with pressure from Strasburg-Franklin defenders during a nonconference game on Saturday at Hoosier Gym in Knightstown, Indiana. 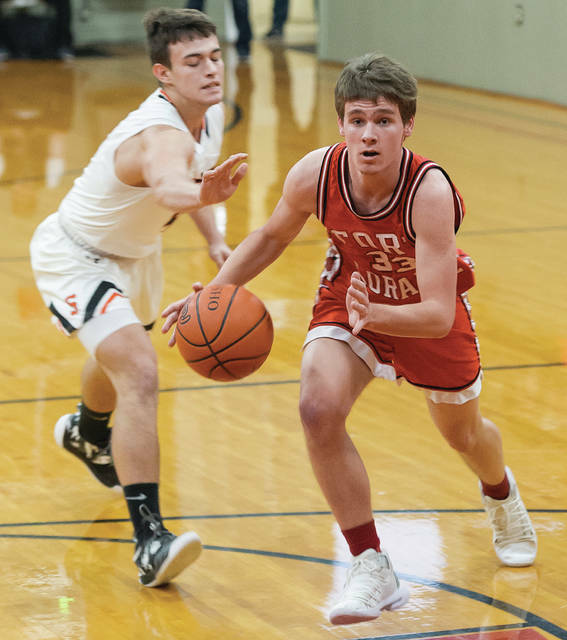 Fort Loramie senior guard Eli Rosengarten dribbles with pressure from a Strasburg-Franklin defender during a nonconference game on Saturday at Hoosier Gym in Knightstown, Indiana. Fort Loramie’s Mason Kemper shoots with pressure from a Strasburg-Franklin defender during a nonconference game on Saturday at Hoosier Gym in Knightstown, Indiana. Fort Loramie’s Carter Mescher shoots a free throw during a nonconference game against Strasburg-Franklin on Saturday at Hoosier Gym in Knightstown, Indiana. KNIGHTSTOWN, Ind. — In Knightstown, Indiana, on Saturday night, long after the 8 p.m. finish of the game between Fort Loramie and Strasburg-Franklin, the Redskins’ opponents may have developed a few brief nightmares. 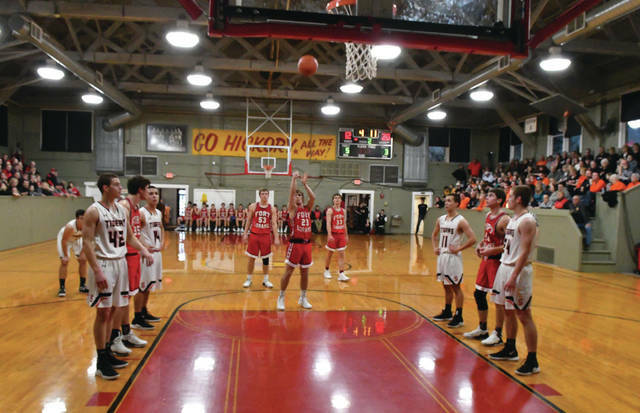 Of Fort Loramie shooters leaning their backs out-of-bounds against the muted grey Hoosiers Gym walls around the narrow floor, as they popped in three-pointers like layups. 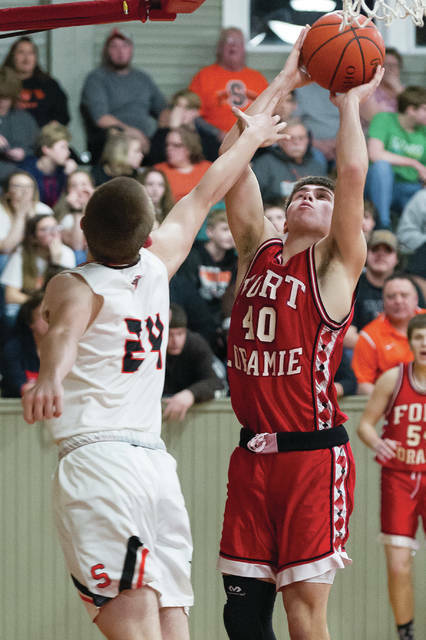 Of Fort Loramie players getting barricaded by defenders in the fourth quarter as the referees’ ten-second count reached seven, eight, and nine — only to be saved by Gene Hackman rising from the bench to signal a time out, just in the nick of time. Yes, these are wild exaggerations. But, yes, in the home of Hickory High, the Redskins “put the wood” to the Strasburg-Franklin Tigers, 56-49, before nearly 500 fans. Their voices reverberated loudly in the cozy, iconic venue. The final score wasn’t indicative of the middle 16 minutes of the game during which Fort Loramie led by double digits. Nolan Berning came off the bench to bury two treys in the first quarter to help stake the Redskins to a 14-10 lead after a period. The jaws of the Strasburg faithful dropped even further when Eli Rosengarten, a ScoresBroadcast.com player of the game, swished three in a row from long range in the second stanza. When Nathan Ratermann poured in another from distance and Carter Mescher exploded down floor on a drive to the hoop, the bulge ballooned to eleven points at the break, 30-19. Strasburg head coach Adam Hall lamented that his players were too often trying to fight through screens at the top of the key when the ball was being thrown over their heads. “We were not in position to close out on shooters,” he said. Fort Loramie had post presence in the game; Strasburg did not. In the the contest’s first minute, the Redskins 6-4 Mason Kemper, the other ScoresBroadcast.com player of the game, hit two buckets near the rim, one a short hook shot. Kemper was 5 of 7 from the floor for the night. In the game’s final minute, Kemper’s nifty bounce pass to Grant Albers triggered an easy deuce and sealed the victory. The Redskins bench and physical play were factors, too. Britton inserted ten different players over the first ten minutes. Strasburg played only seven the entire night. Mitch Niedenthal recorded 21 points to head the Strasburg attack. His twin Mike added 9. The Fort Loramie coach said his club could have felt sorry for itself after being beaten by the Rockets less than 24 hour before. “Instead, we were resilient. We fought back this evening. We have fought back all year through some tough losses. We’ve won ten of our last 13,” he pointed out. Nick Brandewie‘s long, line-drive trifecta to start the fourth quarter lifted the Redskins to their biggest margin on Saturday, 43-29. Three different players — Brandewie, Mescher, and Rosengarten — drained 9 of 10 free throws in the last five minutes to stave off the Tigers. For the contest, Rosengarten tallied 15 and Kemper, 10. Brandewie notched 8, and Mescher added seven in about 18 minutes. Berning and Nathan Ratermann scored six each. Albers chipped in with four. The Redskins had previously lost four very tight games by a total of 15 points this season, including two on last-second 40-footers. The last thing they wanted was another thrilling conclusion, like Milan in real life and Hickory in the film created at the buzzer. 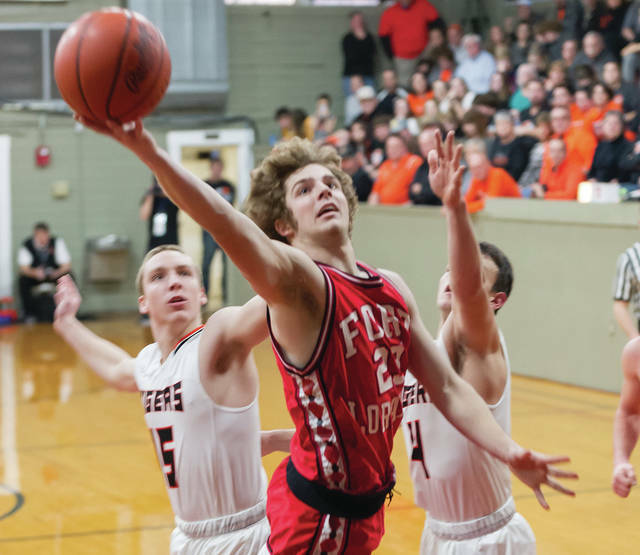 Dan Holland, Fort Loramie superintendent, noted that such an event gives the high school’s student-athletes an opportunity to showcase their skills on the road and demonstrate what Shelby County basketball is all about. “Performing here at the feature film’s Hoosier Gym enables our players to gain a special experience that benefits them, their families, coaches, and the entire community,” Holland stated. The two head coaches met briefly after the game on Saturday night. For quite some time they had planned a unique setting for a head-to-head match-up between the schools. “Wish we’d played better. Give Corey’s club a lot of credit. It was like a bad dream though. I still have visions of all those 3-pointers going swish, swish, swish,” Hall said. He then asked an Ohio media representative if Fort Loramie had “shot lights out like tonight” all season long. “Only on neutral floors in Ohio and Indiana,” was the tongue-in-cheek response. A better answer than you might think, however. The Redskins have won 11 of their last 12 at the Piqua sectional. Success in the Hoosier Gym can only help to get them tourney ready.